The social media space is constantly changing, but we've got you covered right here—every month—with all the updates savvy marketers need to know! "Moderation queues will be temporarily unavailable" – A new moderation function will be released in the coming months. "Admin roles will be streamlined to just owners and managers" – This is meant to make it less confusing. "Admin and auto-generated group emails (including digests, automated templates, and announcements) will be unavailable" – It sounds like LI wants these types of communication to mostly come through as Notifications from now on. If any of this raises red flags for you, check out the Help article for more information and recommended action steps. To make a long story short, positions you held at the same organization are now grouped together! If this change isn't happening automatically on your profile, try to make a few edits and see if it works. If not, try again soon as the update rolls out globally in the coming weeks. For more info, read the announcement blog post. This basically means that if you have a large enough page, Facebook may soon ask you to verify that you are a real-life person. Luckily, the process will be initiated automatically at the top of your account's news feed and "should only take a few minutes to complete." Enforcement of the policy will take effect in the next few months. In July, Instagram introduced a "You're All Caught Up" message that displays whenever a user reaches the "end" of their Instagram feed. It displays when you've seen everything the accounts you follow have posted in the previous 2 days. Now, IG will show you content from accounts you don't follow. Touted as "a new way to see content you may like on Instagram," these recommendations are based on the accounts followed and content liked by each user. This appears to be a way to boost engagement on the platform by encouraging people to expand their horizons. By introducing new, related accounts to users who have exhausted that day's available content, maybe they will continue hanging out on Insta for even longer. Facebook rolled out two big projects aimed at helping parents and teachers manage social media use by children. The first is the Facebook Digital Literacy Library: "Find lesson plans designed by experts to help young people develop skills needed to navigate the digital world, critically consume information and responsibly produce and share content." The Instagram team rolled out similar tools recently, as well. The Parent's Guide is an addition to the "Wellbeing" focus we've at Instagram seen in recent months. The Parent's Guide includes a website (parents.instagram.com) with numerous tips and facts about Instagram, as well as a downloadable pamphlet for talking to teens about IG. The accompanying video interviews various Instagram executives and employees, highlighting those who are also parents. 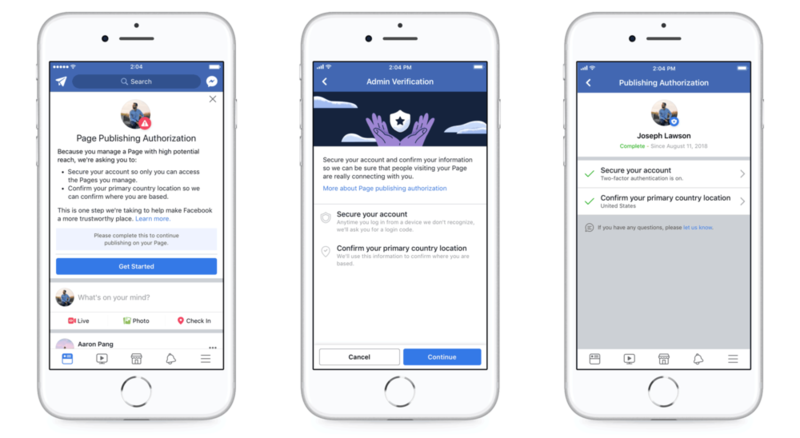 The ads policy also establishes "a certification process that verifies an advertiser’s identity and location within the US." There were no large-scale updates on Snapchat in the past month or so, but Snap's business team did put out an interesting blog post outlining the platform's addressable reach—"the number of Snapchatters who can be reached with Snapchat ads in a month"—around the globe. The post also notes that these figures are for Snap Ads only and this "does not include reach on Story Ads, Filters or Lenses." As those investing in Snapchat continue to question the longterm profitability of the platform, it's likely we will continue to see posts like this that highlight Snapchat's advertising potential. LinkedIn's Top 50 U.S. Startups – Lyft got #1 (sorry, Uber). Rankings were determined by "employment growth, engagement, job interest and attraction of top talent" determined by various metrics including LinkedIn company page views and "how many employees the startup has recruited away from LinkedIn Top Companies." AdWeek + Facebook: How to Master Vertical Video – This is a really cool piece with tips and thought starters on thinking vertical when it comes to video production. Facebook updated video ad metrics, again – These updates include the removal of the 30-Second Video View and Video Percentage Watched metrics. YouTube's Digital Wellbeing Tools are Now Live – Announced last month, tools like time watched, break reminders and notification limits are now available. Video Chat AR Games in FB Messenger – Users of Facebook's Messenger app can now compete with friends using augmented reality. Two games are available now: "Don’t Smile" and "Asteroids Attack."